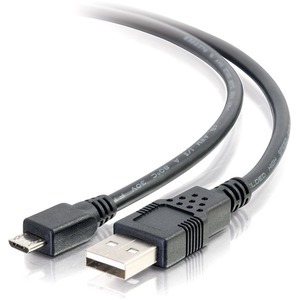 Micro-USB cable from Cables To Go allows you to connect to cell phones, GPS systems, PDAs, OTG devices and digital cameras using the Micro-USB connection. The Micro-USB connector's small form factor is ideal for today's small portable devices while offering better performance than previous USB standards. Whether you are replacing a lost cable or looking for a second cable for the office, this cable can allow you to quickly and easily transfer data or charge your device.